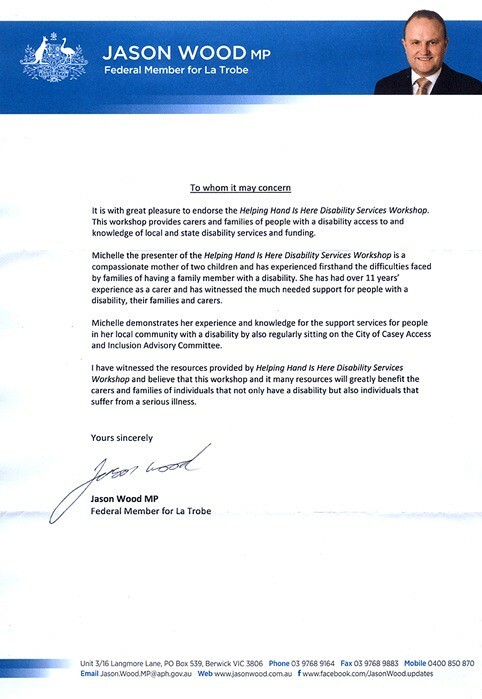 It is with great pleasure to endorse the Helping Hand Is Here Disability Services Workshop. This workshop provides carers and families of people with a disability access to and knowledge of local and state disability services and funding. Michelle the presenter of the Helping Hand Is Here Disability Services Workshop is a compassionate mother of two children and has experienced firsthand the difficulties faced by families of having a family member with a disability. She has had over 11 years’ experience as a carer and has witnessed the much needed support for people with a disability, their families and carers. Michelle demonstrates her experience and knowledge for the support services for people in her local community with a disability by also regularly siting on the City of Casey Access and Inclusion Advisory Committee. I have witnessed the resources provided by Helping Hand Is Here Disability Services Workshop and believe that the workshop and it’s many resources will greatly benefit the carers and families of individuals that not only have a disability but also individuals that suffer from a serious illness.